The opening scene in The Frogs: Recroaked is sufficient to work out, very broadly speaking, what sort of an evening at the theatre a production of this nature is. The audience is told, plainly and simply, that this is all “meaningless” or otherwise “harmless” fun. If there any contemporary links to be made with this adaptation of an ancient Greek comedy, the production does it all for the audience – there are references galore to (amongst other things) hashtags, Eurostar, Instagram, Uber (which does not provide rides to the underworld) and The Referendum That Must Not Be Named (alternative term mine). This is, therefore, an ambitious project, coming at a time when what is going on in the corridors of Parliament is threatening to leave creators of shows like this with an absurdist slant struggling to compete. The prologue ends with, “Refunds will not be issued”. My interpretation of that, with the benefit of hindsight having seen the show, is this: if silliness with a capital S isn’t your cup of tea, well, frankly, there are other shows on the London stage for you. However long the rehearsal period actually was, this production does well to portray, quite deliberately, the play as something thrown together relatively quickly. Even the show’s programme joins in on the act, apparently listing the cast ‘in no particular order’, adding, “Seriously, we just needed to fit them on the page”. Some of it was more interesting than others – the journey into the underworld, allegedly necessary in order for Dionysus (Jac Norris, who possesses excellent stage presence) to ‘save the arts’, held my interest far more than a later encounter when he and his ‘slave’ Xanthias (Francesca Elise) reach their destination. A literature figurehead is required to write new material in order to improve the quality of theatrical plays (yes, it’s a slight on the many talented playwrights out there, but there’s a need to be rather un-shockable here and go with the flow), and Dionysus finds himself having to choose between Lord Byron (James Bruce) and Mary Shelley (Sydney Feder). The latter, despite being an English novelist, has an American accent – make of that what you will. A literary debate ensues, chaired by someone called Flouton (Malik Dapaah). On the panel with Dionysus is Persephone (Zara Walwyn) – I couldn’t work out from the play why she was there, but of course she is historically known as ‘goddess of the underworld’, and it is reasonable to assume the story takes place in the autumn or winter, when Persephone is underground. I would have more to say about the debate if it were not so tedious. It’s rare for the curtains to still be drawn so far after a play has started – the initial scenes are acted out in front of the said curtain. But there are frogs in The Frogs (puppet frogs, mind you, as per The Book of Mormon), the repeated croaking refrain unchanged from Aristophanes’ (c. 446BC-c. 386BC) version. The scene changes are reasonably slick, and the acting is highly convincing. But rightly or wrongly, the comedy elements shone through much more than the socio-political issues the production raises. The role that the performing arts plays (sorry) on society at large could have been explored in greater depth. A brief, but nonetheless pleasant if quirky show. 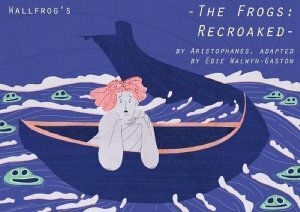 The Frogs: Recroaked is a modern adaptation of Aristophanes’ cheeky, political comedy, The Frogs. After deciding that the mortal world is distinctly lacking in the arts since the death of Lord Byron, Dionysus, the god of all things fun, decides to journey down to the underworld with his slave Xanthias, and bring Lord Byron back from the dead. Disguised as his older half-brother Herakles, Dionysus and Xanthias have to rely on their wit and charm to get past the strange inhabitants of the underworld including the mischievous frogs, a group of hippies, and sassy innkeepers; as well as negotiate a rift between Lord Byron and his former friend and fellow writer Mary Shelley.